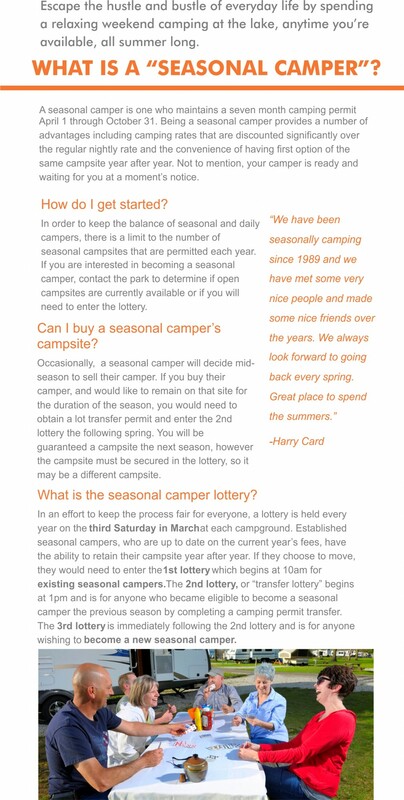 The Seasonal Campers Lottery will be held on the 3rd Saturday in March, which is March 16, 2019,for all park and marina locations. As a reminder, full payments will need to be made no later than March 11, 2019 for customers who have not made the early payment and who are not taking advantage of the 4 payment plan. This will allow our staff the opportunity to update the lots available lists and put them out for customer review several days ahead of the actual lottery. The 1st lottery will start at 10am and the 2nd and 3rd lotteries will begin at 1pm running consecutively until completed. The break between the 1st and 2nd lotteries will allow customers an opportunity to update their list of available lots and visually inspect the lots that have become available as a result of the 1st lottery. This lottery schedule has been successful in a number of our facilities over the last few years. It greatly reduces the stress on the customers in addition to providing an opportunity to make more informed decisions when choosing a lot. Following the lottery, we ask that all customers who are required to relocate be on their newly assigned lot no later than April 1st.